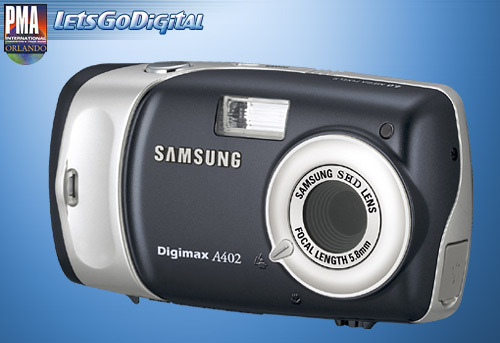 Samsung Digimax A402 introduction : Samsung is proud to announce the incredibly stylish Samsung Digimax A402 at PMA 2005. Available in Neo Silver, Parvin Black or Ruby Red and with its main function controls accented in silver, the Samsung A402 is sure to grab the attention of those looking for the cool factor at this year's PMA. With an approximate street price of $139.99, the launch of the new Samsung Digimax A402 underscores Samsung's commitment to providing advanced technology at prices consumers can afford. 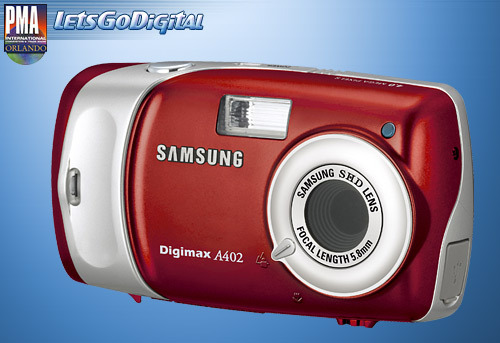 The Samsung Digimax A402 features a 5x digital zoom and captures super-crisp images at a maximum size of 2272x1704 pixels, with its 4.2 mega pixel (total pixel), 1/2.5" CCD image sensor. The Samsung A402 supports eight different power sources (AA Alkaline, Lithium, Ni-Mn, Ni-Zn, CR-V3, Ni-MH, Ni-Cd, and the Digimax I-Pack SBP-1303) and offers numerous flash modes, including auto, auto and red-eye reduction, fill-in flash, slow sync and flash off. The Samsung Digimax A402 also allows shooters to experiment with black and white as well as sepia shooting modes, further expanding the creative capabilities of the camera. The remarkably compact Samsung Digimax A402 measures in with dimensions of 93 x 52 x 30mm and boasts a large, 1.8-inch LCD. In addition to supporting SD/MMC memory format (up to 512MB guaranteed), the Samsung Digimax A402 also features 16MB of internal flash memory, a feature that comes in handy when no external memory is available. Samsung A402 users can capture AVI movie clips with sound at resolutions of either 320x240 or 640x480 and can record up to 1 hour of voice/audio. The length of the movie clips are only limited to the capacity of the SD/MMC memory card used at the time. For additional levels of customization, shooters can also add up to 10 seconds of voice/audio to any still image.